The 2018 U.S. Open Squash Championships draws have been released as Egypt’s world No. 1’s Nour El Sherbini and Mohamed ElShorbagy lead the field as top seeds. The draws reveal an arduous path to a successful title defense for Egypt’s 2017 champions Nour El Tayeb and Ali Farag. 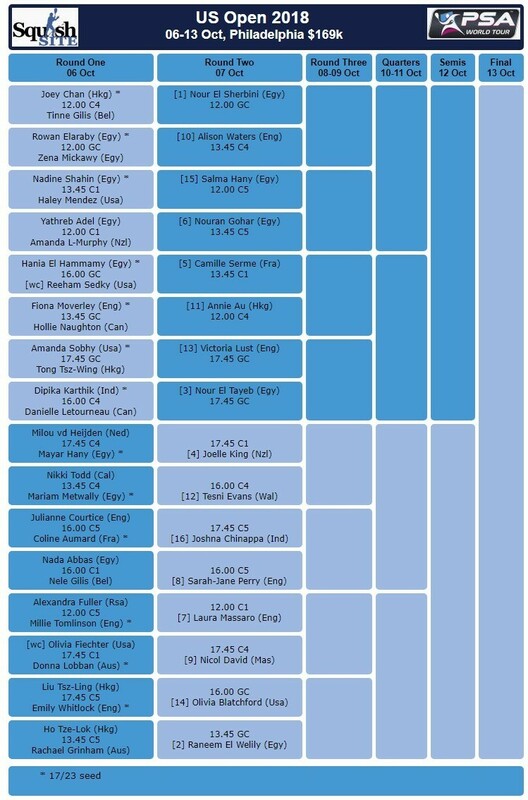 El Tayeb, the women’s three seed, slots into the top half of the draw and could face Team USA’s Amanda Sobhy in the round of sixteen, Karim2016 champion Camille Serme in the quarterfinals and teammate El Sherbini in the semi-finals. Should Farag progress, the Harvard graduate could face three-time champion Gregory Gaultier in the quarterfinals and world No. 3 Marwan ElShorbagy in the semis. The elder ElShorbagy, Mohamed, is seeded to face off with world No. 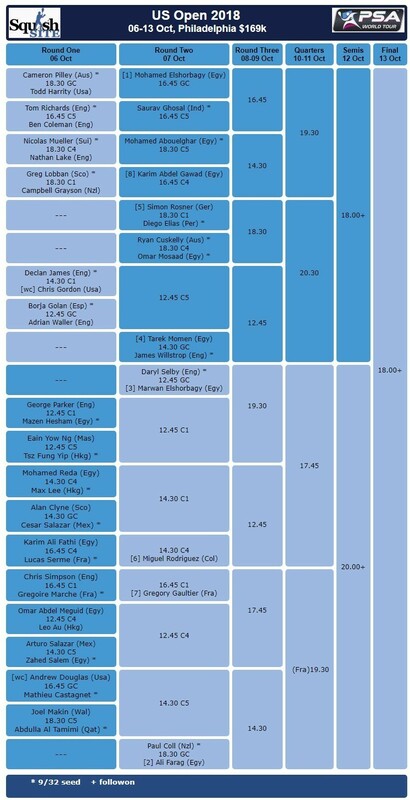 4 Tarek Momen in what would be an all Egyptian semi-final in the top half of the draw. 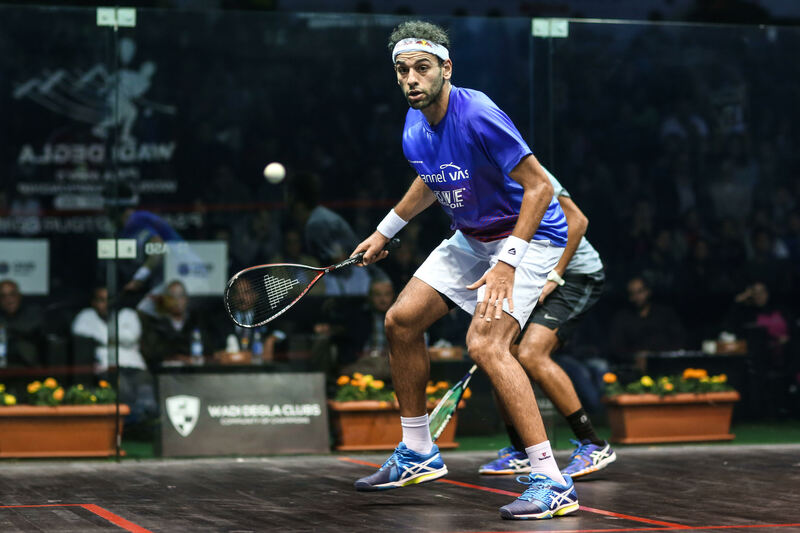 ElShorbagy, who captured his first world championship title last season, is searching for a third U.S. Open title after losing in a U.S. Open final for the first-time last year against Farag. Raneem El Welily, the women’s two seed and world No. 2, will hope for another chance to capture her first U.S. Open title after falling short in the finals last year and in 2012. El Welily, who also captured her maiden world championship title alongside ElShorbagy last season, is seeded to face New Zealand’s world No. 4 Joelle King in what would be a rematch of the 2017 semi-finals. Seven out of eight Americans are set for first-round action. In the men’s draw, Todd Harrity will take on Australian veteran Cameron Pilley in what will be their first career match up. Harrity, world No. 50, is joined by wild cards Chris Gordon and Andrew Douglas. Gordon, world No. 67, is set for his seventh consecutive U.S. Open wild card appearance and will take on England’s world No. 23 Declan James. Later that afternoon Douglas, a Penn sophomore, will make his U.S. Open main draw debut against France’s former world No. 6 Mathieu Castagnet. On the women’s side, world No. 14 Olivia Blatchford is the sole American to enjoy a first-round bye as the twenty-five-year-old awaits either Hong Kong’s Liu Tsz-Ling or England’sEmily Whitlock. After missing the 2017 U.S. Open due to injury, Sobhy returns to Philadelphia in hopes of replicating her 2016 semi-final run. The world No. 18 opens her campaign against Hong Kong’s Tong Tsz-Wing. World No. 43 Haley Mendez qualifies for her first main draw based on ranking after her 2017 wild card appearance and will play Egypt’s Nadine Shahin in one of the first matches on Saturday. Penn’s 2018 Intercollegiate national champion Reeham Sedky will hope to make waves on the professional level against Egypt’s Hania El Hammamy. Recent Princeton graduate Olivia Fiechter marks her wild card debut against Australia. The tournament will be holding in Philadelphia, USA from the 6 -13 of October. The price money has been set at One hundred and sixty-nine Thousand Dollars ($169x 2), equal price money for both the Men and Women.